Ok, it's time for the big reveal! 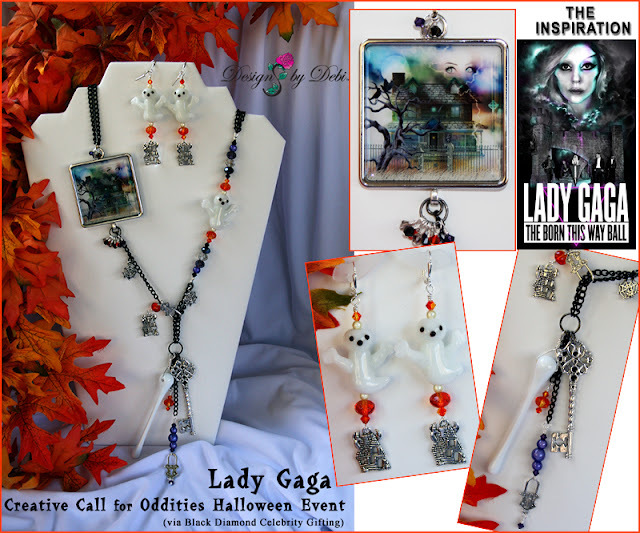 In my last post I showed you some of the parts on my workbench for the Lady Gaga Creative Call for Oddities Halloween Event I was participating in thanks to being contacted by Black Diamond Celebrity Gifting. Well, the jewelry is finished and has been mailed off. I've edited the images and it's time to let you see what I designed! She asked for "Think outside the box...outside the hemisphere. Things that make me go WOW!" So... do you think I succeeded? I hope I did! If you like Halloween and the set I designed, you're going to LOVE this... You could own a similar set! I made a second jewelry set similar to the one for the design challenge for my October 2012 Jewelry for Charity Set. The donation from the sale will be going to Lady Gaga's charity, Born This Way Foundation! They're not exactly the same. Each set is a one-of-a-kind, and they're the only 2 sets like this I'll ever make so, if you're interested, keep an eye on the Designs by Debi website. The charity set will be going up soon! Lady Gaga will think your creation is Gagalicious! It is unique, 'way out there' like she loves, and really does "reveal" Lady Gaga's eclectic style! Love your jewelry designs and creations! Thanks Beth! I had A LOT of fun designing that set! I do hope she loves it!